From a distance, the car would look like all square and no curves but then peek closer and you would notice that the bonnet is rounded off towards the edges. 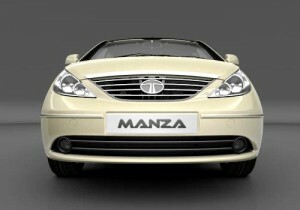 The stretched head lamps look neat as also the big grille treatment with the Tata logo at the center. The air dam also looks cool with two horizontal slats for company. There are two fog lamp inserts which actually look very cool. I would rather say that this car has been penned keeping in mind 3D ideologies in mind. The 185/ 60 R 15 wide tubeless tyres are standard across the range and look good as well. 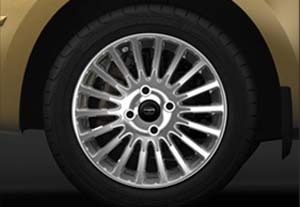 They fill the wheel arches well and leave no point of complaint of the car been undertyred. The wide wing mirrors may cause a problem while navigating in traffic but then it can be easily adjusted internally. There is a single chrome strip running across the length of the car. The boot of this car is really boxy and it seems that from here, the Toyota Etios has also taken a cue. 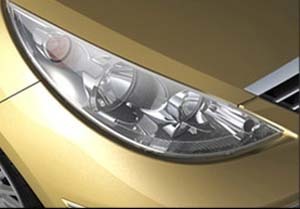 The vertically stacked tail lamps are however a clear lens unit. The tail pipe is also absent from view. There is a chrome boot lid opener which adds some sort of semblance to the design. The 4 spoke steering wheel with audio controls in place would be the future for all of the Tata Motors models in India. The twin circular dials flanked by two smaller ones showing the temperature and fuel gauge look cool. Tata Motors cars usually impress me for the very fact that they are very spacious, the dimunitive Tata Nano included. The company has left no efforts to ensure that this spacious sedan is kitted with features galore. The dials also boast of showing instantaneous and average fuel consumption, date, time and distance to empty. The uniqueness in the instrument console is that unlike other revometer needles which are dipped in red, this one becomes red as soon as you reach the redline. The all beige surroundings lend an upmarket feel to it. The standard music system gets 6 speakers and there is also Bluetooth connectivity. One can sync upto 5 phones at a time and for optimum usage, there is also a full keypad. The driver gets fully adjustable seats as also larger footwell space as compared to the other sedans in this class. Moving onto the rear, people who have sat in the Indigo XL(the one which Meru cabs use) would certainly appreciate the same amount of space in the standard Tata Indigo Manza in India. Whereas the former had a problem with the backrest angle, the latter has no such issues. Infact so comfy are the seats that at the time of been driven, I actually fell asleep. There are rear AC vents as well. There are various cup holders as well which help in the utility factor. Boot space is also good for the class at 465 liters. Since the loading lip is a bit high, loading it would be a bit of problem. Based on the Tata Indica Vista platform, the Tata Indigo Manza also uses the hydraulic shock absorbers at the rear and semi-independent twist beam with coil springs, independent MacPherson struts at the front. This setup has been however tweaked to compensate for the added weight of the sedan. Taking into mind the proportions of this car, it would most probably be chauffer driven and the most important thing in the mind of this buyers would be ride quality. This the Tata car delivers in spades. It tramples upon all of the road imperfections in city speeds but then once on the highway, things don’t look so rosy. It has a tendency to pitch and bob while suddenly applying brakes or going over a big pothole. Now, the steering wheel deserves a praise here as been the most sensitive amongst all of the Tata Motors units. This is one steering wheel which would do the bidding exactly as told to. It is not as direct as its competition (read the Maruti Swift Dzire) but then if you are an average Joe, it would suit you to the T. Even on winding roads, the wide tyres of the car do lend it a planted stance. NVH is something which is a bugbear on all the Tata Motors vehicles but then on this car, it seems to have been sorted out big time. Driving the diesel variant proves this. Its only when the engine nears its redline, that one can feel that this is a diesel. A friend who had the base petrol variant had once said that the petrol motor is almost vibe free and is on the same league as the K series petrol engines from Maruti. The Tata Indigo Manza in India boasts of a petrol as well as diesel variant. 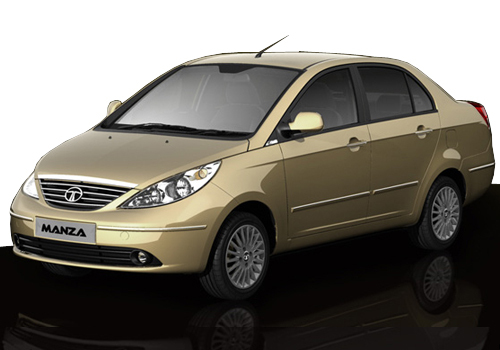 Starting off with the diesel variant, it is the same unit doing duties in the Linea and Dzire. It is a 1.3 liter unit producing 90 PS at 4000 rpm whereas 200 Nm at 1750-3000 rpm is the maximum torque rating. It is mated to a 5 speed manual transmission. The Tata-Fiat alliance has worked wonders for Tata as they are now able to source engines and transmissions from the Italian manufacturer. The gearing for the diesel motor is on the taller side and this does affect initial acceleration. The Manza took 15.4 seconds for the 0-100 kmph run whereas the top speed that it could go upto was 164 kmph. The taller gearing doesn’t help in fighting off the turbo lag in town but then out on the highway, the taller gearing and the VGT do help in stretching the legs of this car. The petrol on the other hand is a 1.4 liter FIRE unit producing 90 PS of peak power at 6000 rpm and 116 Nm of maximum torque at 4750 rpm. It is said to reach the 100 kmph mark from standstill in 13.4 seconds. Its top speed is a bit higher at 168 kmph. It is also combined with a 5 speed manual. 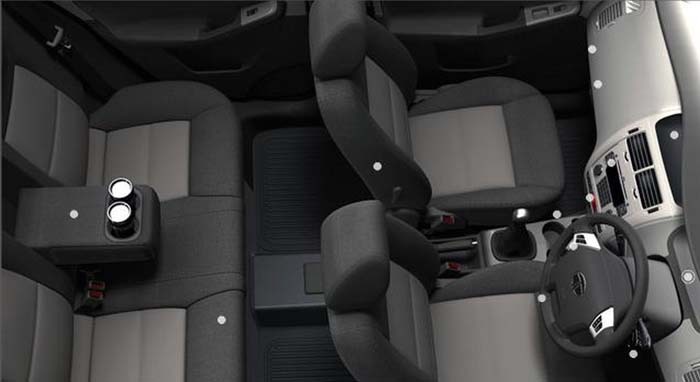 Safety has taken a big leap for Tata Motors with the Tata Indigo Manza in India boasting of 2 air bags, collapsible steering column, tailored steel bank columns and 3 point seat belts. Braking is achieved discs at the front and drums at the rear. ABS as well as EBD are offered on the top variants. The brake pedal feel has vastly improved from the Indica days. Fuel efficiency is always a strong point of Tata Motors cars. The diesel version of the Manza returned 14.4 kmpl in the city whereas the open highways saw it returning a high 20.7 kmpl. The petrol on the other hand gives about 12.7 kmpl in the city and 17.4 kmpl on the highway. The Tata Indigo Manza in India, if its name is to be taken in the Italian sense, is a giant leap forward in terms of quality for Tata Motors. Gone are the days when the manufacturer made cars with inconsistent panel gaps and parts which would fall off after some hard testing. 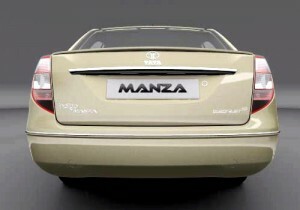 The Manza means now a value for money proposition with its space quotient, refinement and also pretty good road manners. It has got the only problem of brand image in the form of Tata Motors. 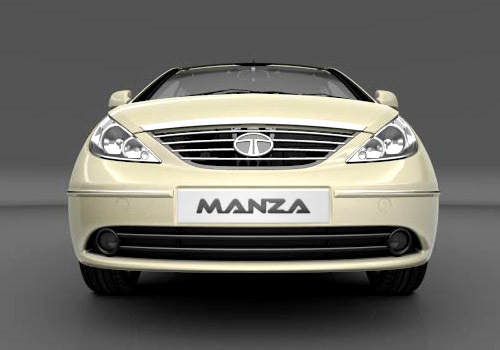 The Tata Indigo Manza price in India is the benchmark as far as entry level sedans go. The price for the base variant of the petrol version is Rs 4.8 lakh ex-showroom, New Delhi whereas the top end version of the diesel would set you back by Rs 6.75 lakhs, ex-showroom, New Delhi. Scores settled, every one in office acknowledged that this is “More car per car”.